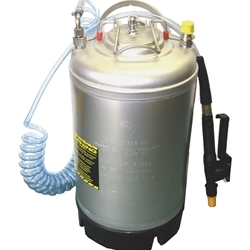 This deluxe pressurized sprayer holds up to 3 gallons of solution in a stainless steel tank. This favorite of residential and commercial window tinters everywhere features a coiled 15' hose to enable you to reach a large area without having to move the tank. Operation is simple. Just fill the tank with desired solution and pressurize with air from any compressor. A relief valve will prevent over-pressurization of the unit. Once you try a 3 Gallon Stainless Sprayer, you will never want to use a trigger or pump sprayer again.